The all-new 2019 RAM 1500 puts a modern twist on trademark RAM style. Updated for this model year to have a more aggressive stance, large standard 18-inch wheels and a new sleeker design, the 2019 RAM 1500 claims the spot of most luxurious truck in its class. It also sports a more aerodynamic shape than previous models with active aerodynamic features like grille shutters and air splitter, which allow for better performance and fuel economy. These features are rare in the new RAM 1500’s class, as they’re usually seen on sports cars. Take a look at the new RAM 1500 in person at Bob Moore Chrysler Dodge Jeep RAM of Oklahoma City. The RAM 1500 has long been known for having one of the most luxurious and versatile interiors of any pickup truck. The 2019 RAM 1500 continues to build on this tradition. The RAMBin interior storage compartments have been a popular feature of the RAM 1500 for years. The RAMBins are back in the 2019 RAM 1500, and are 5.5 inches larger than before. The 2019 RAM 1500 now has available active noise canceling, a feature often seen in high-end luxury cars. Active noise canceling makes for a quieter and more peaceful ride. The new RAM 1500 even has more available leather than before, so your drive can be surrounded by luxury. Experience the luxurious and versatile interior of the 2019 RAM 1500 at Bob Moore Chrysler Dodge Jeep RAM of Oklahoma City today. RAM could have simply relied on the 2019 RAM 1500’s sheer size for safety. It’s true that the body, which is carefully engineered and constructed out of the toughest materials, helps the truck achieve excellent crash test ratings. However, RAM didn’t stop there. 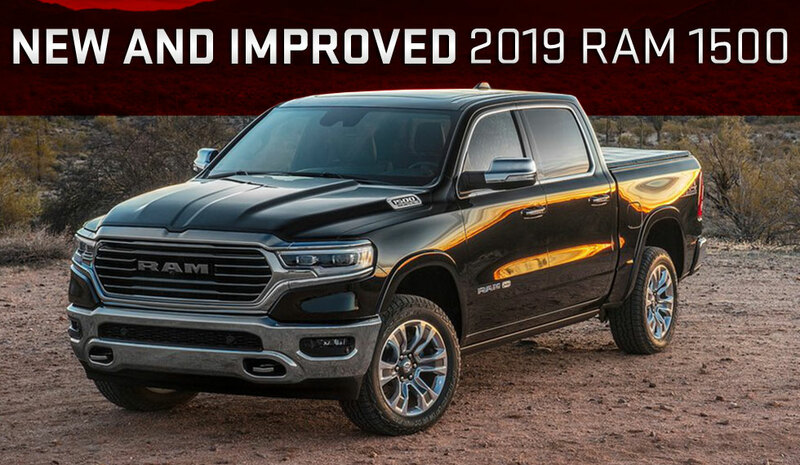 They created a suite of advanced driver aids and updated them for the 2019 RAM 1500. These safety aids include optional Adaptive Cruise Control, which can help you maintain a safe distance from the vehicle in front. Also available is Forward Collision Mitigation which further reduces the likelihood of colliding with the vehicle in front of your RAM. The optional Lane Departure System helps you avoid dangerous sideswipe collisions on the open road. It also comes equipped with optional Blind-Spot Monitoring with trailer detection, a great feature to have when towing. Test-drive the safe 2019 RAM 1500 at a conveniently located dealership in Oklahoma City. Visit Bob Moore Chrysler Dodge Jeep RAM of Oklahoma City today. The 2019 RAM 1500 provides legendary RAM performance elevated with modern technology. The new RAM 1500 is 225 lbs. lighter for better all-around performance. The standard 3.6L V6 making 305 horsepower now has a cutting-edge mild hybrid system. This system was previously only available on the RAM 1500’s HEMI V8 engine options, but is now standard on the V6 engine. The 2019 RAM 1500 also has huge 14.9-inch front brakes for better handling and safety. Large front brakes are vital on a full-size pickup truck, but you’d be surprised at how few of the 2019 RAM 1500’s competitors have them. Take the 2019 RAM 1500 out for a spin today at our Oklahoma City car dealership. Visit us at Bob Moore Chrysler Dodge Jeep RAM of Oklahoma City. The 2019 RAM 1500 offers a lineup of exciting and practical tech features. The 5 standard USB ports ensure that you and your passengers can charge devices and play music on the go. The 2019 RAM 1500 also come equipped with a large standard 8.4 inch high-resolution touchscreen. If you want an even bigger and more impressive touchscreen, RAM has you covered. The massive optional 12-inch high-resolution touchscreen is the biggest in its class and one of the biggest touchscreens available in any car. Music lovers will be delighted to hear about the optional 900-watt, 19-speaker Harman Kardon® stereo system. This premium audio system has the most speakers of any available on a full-size pickup today. This provides an immersive listening experience for you and your passengers. If you’re in Edmond, Yukon, or elsewhere in the Oklahoma City area, you can try out the tech in the 2019 RAM 1500 for yourself today! Schedule your appointment today to test drive your new 2019 RAM 1500 at Bob Moore Chrysler Dodge Jeep RAM of Oklahoma City! Our Bob Moore Chrysler Dodge Jeep RAM dealership in Oklahoma City is a proud member of the Bob Moore Auto Group. You can also contact us today to learn how you can customize your RAM commercial vehicle at our dealership. If you’re not quite ready to come in start by shopping our impressive variety of trucks including properly-equipped, work-ready vans from the RAM commercial lineup, and other RAM commercial vehicles like new RAM trucks and more. Our inventory also includes options for those looking to save with a CPO or used car, truck or SUV. Discover a shopping experience like no other at Bob Moore Chrysler Dodge Jeep RAM of Oklahoma City. Our knowledgeable and friendly will be happy to help with anything you may need by delivering the very best customer service in the area. Bob Moore Dodge Chrysler Jeep Ram	35.5598069, -97.6462308.